Middle-Earth: Shadow of Mordor is a revenge story. Sauron has returned to Mordor and a mystery wraith with a grudge has resurrected you to kill him. But from everything I played in a recent demo, it seems like the orcs and other creatures of Mordor should want revenge against me. In the roughly one hour I spent playing this third-person, open-world action game during a demo last week, I did nothing but connive and kill and turn allies into enemies. Sometimes things would play out as I planned them to—I'd target an enemy commander and use my wraith abilities to turn his once-loyal bodyguards into their usurpers. But my manipulating didn't always go as smoothly. Sometimes my chosen champion would die in battle, either because he was too weak or because I accidentally let him die. Sometimes the warchief target would run off and I'd chase him down a field for longer than I care to admit. A shadow step—a wraith move that teleports you—helps a lot in these cases, but once these guys are committed to running they are committed. The demo I played took place many hours into the game, I'm told, and many hundreds of miles from where the story begins at the Black Gates. It's in this newly-revealed region—the Sea of Núrnen—that I'd meet one of the last kingdoms still holding on to the resistance against Sauron and his dark army. The kingdom's queen sends a very clear message, and in a cinematic we hear her say, "Find an orc leader, make him a warchief and all his soldiers will be yours." So your mission goal is to go deep behind enemy lines into Sauron's territory to raise an army of orcs in your quest for revenge. Middle-Earth: Shadow of Mordor's standout feature—at least according to its developers at Monolith—is its nemesis system. It's a basic map of the current standing warchiefs with lines drawn to their connected bodyguards. You can gather intel about these warchiefs and their counterparts by using your wraith abilities to persuade the dwellers of Mordor to give up information about them. You'll learn about their locations, their strengths and their weaknesses. This helps you decide what stories you want to pursue and with who. Save for a bit of dying, I did nothing but pit one orc's bodyguard against their leader after another. I played the field. Warchiefs don't wander Mordor freely, though. As you can imagine, they've built up quite a few enemies on their way up the dark army ladder. By gaining intel on them you can identify what will draw them out for a challenge. Several warchiefs I went after had an affinity for brawls and duels; others were more into fights involving hounds (or Mordor's version of hounds). Each warchief's personality shapes the encounter you'll have with them. It'll also determine the backstory. I'm told that there are thousands of lines that come into play during the dialogue, impacted by those player stories, like, say, the orc that lost his arm in a battle against you. Each enemy will remember your previous encounters with them and react to that, and as you progress through the game, these characters will also level up if you haven't killed them. "You should never hear the same line twice," said designer director Michael de Plater during a demonstration of the game last week. If you kill an enemy through the nemesis system, they'll drop a rune that you can use to customize your weapon. A leveling system partly taking place through weapons was an intentional design meant to give each weapon a legendary story, and one that enemies will know by name and could even fear. Of course, other quests exist and you can explore the world at your own pace, but I spent all my time hunting. I gathered intel on my targets—the commanders—and picked a bodyguard of theirs to will into betraying them. Picking a strong enough character to be able to take the commander down is key, but so is making sure you can defeat them thereafter. Manipulating power struggles is the basis of the nemesis system. Combat itself is fun if familiar and reminiscent of a few other titles that have set those examples. You can use a combination of strikes a la the Batman or Assassin's Creed series to swiftly move between enemies and even take a few down in a stylistic animation. The wraith-specific abilities really shine, and you almost always rely on them in battle. Some are good for movement and others sweep around to strike multiple enemies at once. Outside of those special combat abilities, you can experiment with a mixture of those melee strikes, ranged attacks and stealth moves. You can dart across the battlefield toward your target, which is particularly helpful when you're attacking or aiming to mount a ridable creature. 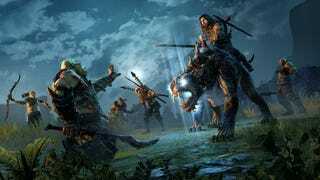 In the new gameplay trailer way above, you'll see player character Talion use ridable cat-like creatures to both move swiftly across the map as well as mow down enemies and even have his pet chew chunks of meat off of them. It became routine for me to seek out these cats—Caragors, as they're called—before entering any battle. Sadly, manipulating power flow isn't as easy as strategizing and coordinating attacks. There's a bit of luck involved—your chosen betrayer can't die in battle, and it can sometimes be hard to keep track of them to keep them alive when you yourself are fending off enemies. It's all about tactful execution once you've determined your plan of action. At least for me during my roughly one hour of time spent with the game, most of my plans didn't go according to how I organized them. I died often. The commander bodyguards I chose to betray their leaders also died often. Or they killed their leader only to die shortly after, forcing me back into the nemesis system to plan my next strike. And I'll keep going back until I amass that army of orcs. Middle-Earth: Shadow of Mordor releases on October 7 for Xbox 360, Xbox One, PS3, PS4, PC.